You’ll find a variety of options for lodging near Cartersville, along Interstate 75, north of Atlanta. Just about every attraction near Lake Allatoona is right around the corner from Cartersville. The links below will connect you to national hotel chains and other options for spending the night or setting up a home away from home while visiting Cartersville. 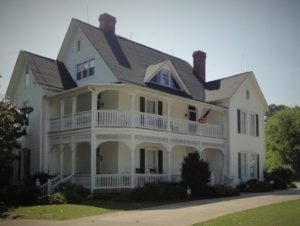 The Lake Allatoona Inn — a bed and breakfast Inn located in a beautiful Victorian house built in 1893 — is especially inviting. We offer this service as a courtesy, but we make no guarantees pertaining to your private transactions for accommodations with any of these sources. We hope you will sleep well … if the excitement of vacationing on Lake Allatoona doesn’t keep you up all night with anticipation.